‘Wood’ you decorate your home with the whimsical? KARACHI: Yaar ko hum ne jaa bajaa dekha, Kabhi zaahir kabhi chupa dekha (I saw my Beloved everywhere, Sometimes apparent and sometimes hidden). 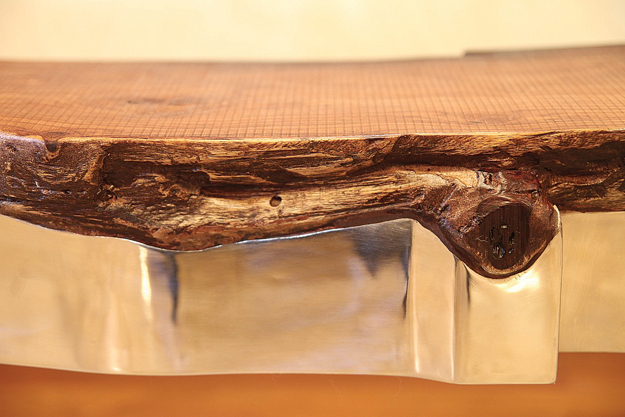 Unassuming at first glance, there is a rectangular wooden table with immaculate finish. But upon closer inspection and you see the preceding couplet written on both its sides in delicate brass inlay work. “This is called Khatt. 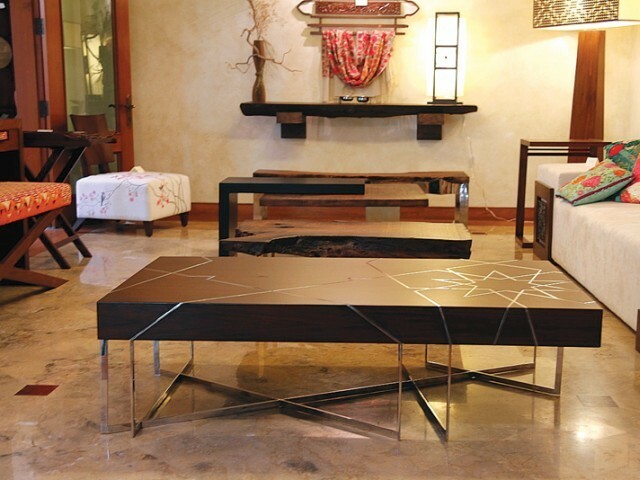 I name each of my pieces,” says architect-turned furniture designer Zahra Ebrahim. Each of her 100 plus pieces of furniture on display are decorated with subtle detail. With a multitude of furniture shops in Karachi, Ebrahim, seven years into the business, is still operating from home and her workshop, with one to two exhibitions in a year. And to highlight the contributions of local artisans, Ebrahim and her partner Rubain Ali Amir make sure they hand a paper to each potential client titled ‘Celebrating our artisans’. It states the various techniques and forms of craft they use including wood inlay, brass inlay, and rilli qulits (quilts) from Sindh, which Ebrahim utilises as upholstery. “The rilli is whimsical in nature,” its says. When mentioning the blue Hala pottery, she makes a special mention of Jaan Soomro from Hala and other artisans like him. 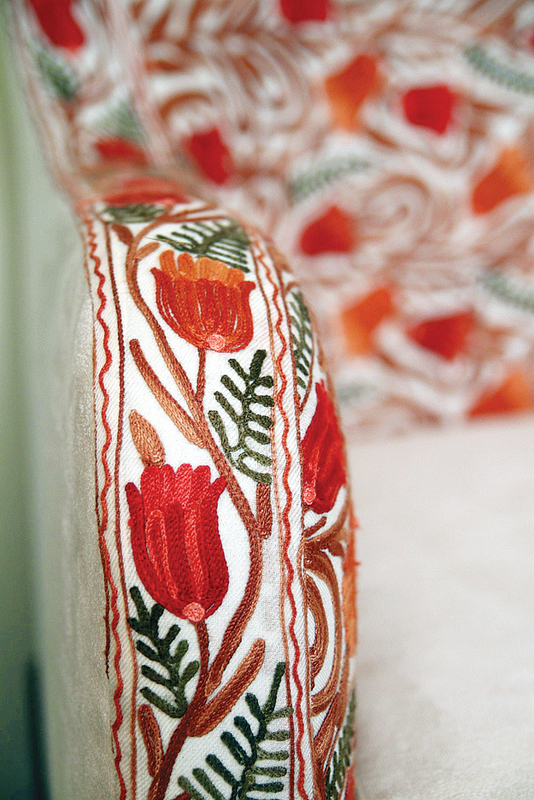 The collection comprises chairs and sofas upholstered with kilms, rillis from Sindh, and Kashmiri and Swati embroidery. It also offers a variety of lamps, trolleys, wall hangings, almirahs, levitating corners and shelves, sofas and tables. Owing to perfection in the finish and dependable quality of wood (mainly sheesham) of her pieces, connoisseurs of furniture are willing to pay even a slightly steep price for them. But what rivets their attention is the thematic and cultural influences in her work. With names such as Aztecs (Mexico), Khul Ja Sim Sim (Middle East), Dancing Gopis (India), Alhambra (Spain) and Tutankhamun (Egypt), her furniture pieces are analogous with travelogues. A resident of Karachi, Ebrahim celebrates the sights and sounds of the metropolis through her work, for instance, a thematic set of trays with black crows, bougainvilleas and landmarks, which represent the city. Also mentioned are woodcut or xylography and geometrical designs. When it comes to calligraphy, Ebrahim prefers the Kufic script. “The low vertical profile and horizontal variations in it are beautiful. 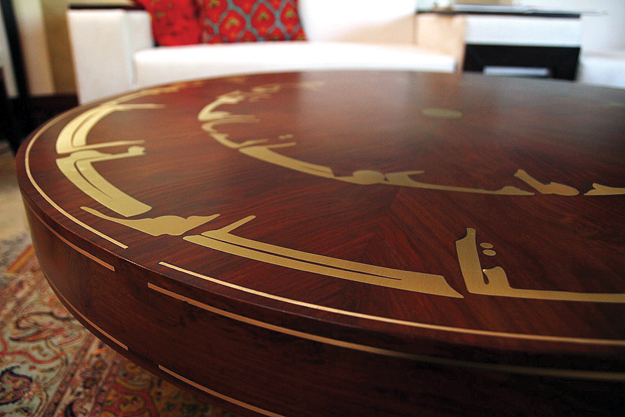 I enjoy the vagueness in Kufic script, where the boundary between word and design disappears,” she says. Posted in Karachi and tagged art, decor, life and style, Pakistan, wood work, Zahra Ebrahim. Bookmark the permalink.